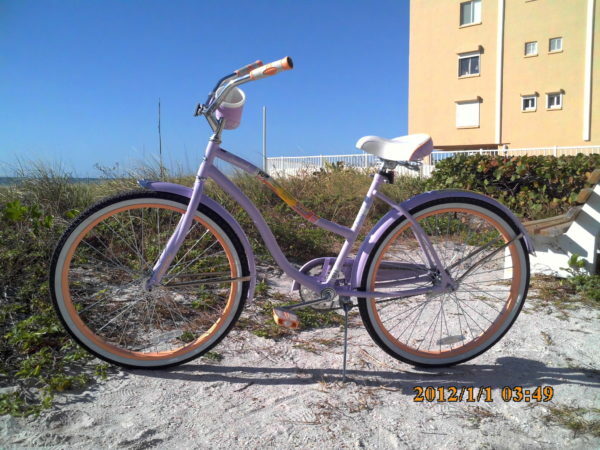 This bike is ideal for anyone looking to be riding around the island in style. It features a lightweight 28.5 pounds made out of an aluminum frame making it easy to transport from car, or trolly, to street to beach. With the classic design and extra-low dropped top tube this bike was designed with maximum comfort in mind. The single speed and coaster brakes provide simple and safe riding. The lightweight alloy rims and an alloy crank help keep the weight down. Our Ladies bike come in either 24″ or 26″ just specify in the notes section which size you need.